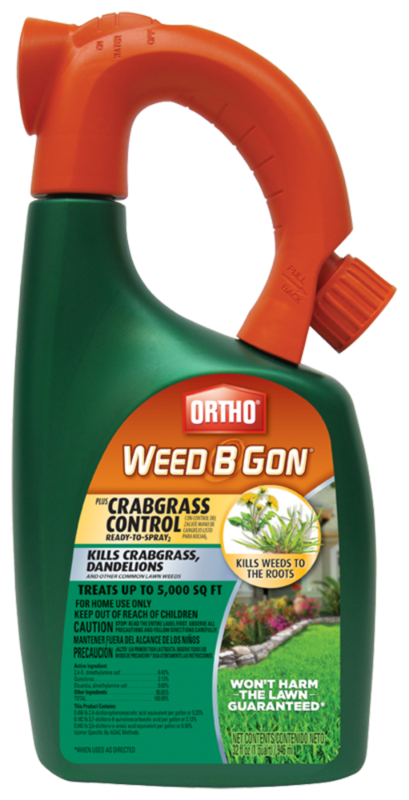 Ortho® Weed B Gon® plus Crabgrass Control Ready-To-Spray2 is guaranteed to kill crabgrass, dandelions and other listed common lawn weeds to the root! When used as directed, you can kill over 200+ weeds without damaging your lawn. It starts working immediately! Lawns. Kills weeds, not lawns when used as directed. See label for list of grass types. Do not use on Bahiagrass, Bentgrass, colonial or creeping, Carpetgrass, Centipedegras, Dichondra, Gardens including fruit trees, vines and berries, Ornamental plants (flowers, trees, groundcovers, landscape beds and shrubs), Seashore Paspalum, St. Augustinegrass, Turfgrass species that are not listed on this label. Spray any time weeds are actively growing. For Best Results - Spray when daytime temperatures are above 45°F and below 90°F. Apply to actively growing weeds as needed. Wait 21 before reapplying to same weeds. Do not apply more than twice per year. Kills common and tough weeds including: Crabgrass, Dandelion, Clover, Ground Ivy (Creeping Charlie), Plantains, Thistles, Field Violet, Yellow Woodsorrel, Pennywort (Dollarweed), English Daisy, Wild Garlic.